The chief source of the drug Daruharidra is Nepal and also collected in fairly large quantities from Chamba district of Himachal Pradesh and Tehri-Garhwal of Uttarakhand during Aug-Sept and are sold in drug markets of Chamba, Dehradun and Haridwar. Daruharidra has diaphoretic, rejuvenating, antipyretic properties and is a bitter tonic. It is laxative, antiseptic, and ophthalmic. The root has anticancerous, hypoglycemic, anti-inflammatory properties and it stimulates the cardiovascular system. Root bark is antiamoebic, antibacterial, anticoagulant and hypotensive. Daruharidra is useful both, internally as well as externally. The fruit, root bark, stem, wood and extract are used for medicinal purpose. Externally, the wounds are dressed with the medicated oil of the decoction of Daruharidra. It reduces the pruritus. The paste applied on painful and swollen parts effectively mitigates the symptoms. Internally Daruharidra is useful in a vast range of the diseases like in treating anorexia, dysentery, hepatitis and liver disorders. As a blood purifier, it is used in combination with other drugs. Part used- Root, stem, bark & fruit. Rasaunt (Rasanjana) A very valuable and popular preparation called Rasaunt or Rasanjana is a crude extract prepared from the root bark of Daruharidra. For preparing Rasaunt, the bark of the root and of the lower part of the stem is boiled in water, strained and evaporated till a semi-solid mass i.e. rasaunt is obtained. The decoction of rootbark, mixed with equal quantity of milk is boiled until it becomes a solid substance. Rasaut is fairly soluble in water. It is mixed with alum and lime-juice and is applied externally to the eyelids to cure eye diseases. It is also reported to be a mild laxative, a tonic and is useful in curing ulcers and fevers. Rasaunt is used as a purgative for children and as a blood-purifier. It is also given in diarrhoea, jaundice and skin diseases. It is extremely valuable in bleeding piles. A watery solution of this preparation is used for washing piles and sores. According to Maharshi Vagbhat and Yogaratnakara, rasanjana is the drug of choice for internal and external uses in the management of diaper rash and proctitis in children. Rasanjana alleviates the diseases of the eye and ear. In the diseases of the eye, it is applied on the eyelids and mixed with rose water & can be instilled into the eyes, in inflammatory conditions. It is useful in infections of the ear. Rasanjana mixed with honey is a useful application for mouth ulcers. The fruits (raw or cooked) of Daruharidra are eaten by the villagers in the hills[. A well-flavoured fruit, it has a sweet taste with a blend of acid, though there is a slight bitterness caused by the seeds. The fruits are juicy and contain plenty of sugars and other useful constituents. Flower buds are added to sauces. Other Utilization: This plant is also an important source of dye and tannin and is used for dyeing clothes and for tanning leather. 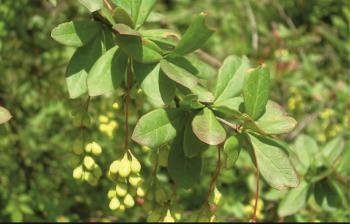 Berberine has been used historically as a dye, due to its yellow color. Recommended Adult Dosage: Root Bark Extract: 500 mg to 3 g powder. Root: 3 to 5 g powder. Berries: 1 g powder. Important Ayurvedic Preparations: Darvyadi kavatha, Darvyadi leha, Darvyadi taila, Rasanjana, Dashanga lepa, Darvi Ghana Vati etc. Caution and Contraindications: In higher doses, Daruharidra gives rise to symptoms like vomiting, severe diarrhoea, excessive sweating etc. In such cases, withdraw the drugs which contain Daruharidra. Berberine has been shown to be safe in the majority of clinical trials. However, there is a potential for interaction between berberine and many prescription medications and berberine should not be used by pregnant or breastfeeding women due to potential for adverse effects in the newborn. Daruharidra is a very useful herb in children diseases. It is also known as Bal Bhaishajya, the plant with a long history of medicinal use in Ayurvedic medicine. Effect- alleviates Kapha and Pitta doshas. 1. The decoction of herb helps reducing swellings in hepato-splenomegaly. In jaundice, it works well when given with honey. 2. Daruharidra, as an adjunct, is effective in the treatment of obesity to reduce excessive fats. 3. The decoction along with haridra, is good anti-diabetic combination. The decoction also helps in healing the diabetic ulcers. 4. Daruharidra works well as a bitter tonic. It is very useful for remittent and intermittent fevers. For that, the decoction is given with rock candy twice a day. 5. It is used as a general tonic in debility due to fever. The alkaloid berberine possesses antibacterial and anti-inflammatory activities. 7. The fruits of Daruharidra are given as a laxative to children. It is effective in controlling gastroenteritis. It is a good anti diarrhoeal agent and could be easily administered in children in the form of a palatable suspension. The drug is free from any toxicity. 8. Berberine has also shown antitumour activity. 9. The dried extract of the root is used as local application in eye diseases. Daruharidra is useful in a vast range of the diseases like in treating anorexia, dysentery, hepatitis and liver disorders.